It doesn’t happen very often that I stroll in Gamla Stan (the old town) with my mother, but last Saturday it did! We’d been told about a new gallery with an exhibition that we both were keen to see. 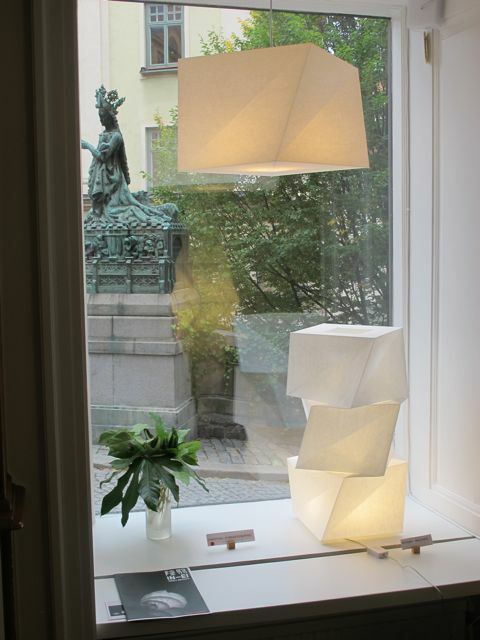 Galleri Yamanashi is situated on Köpmantorget 10 in Gamla Stan and the work on show is clothes and lights by Issey Miakey, sculptural and foldable made in recycled plastic. 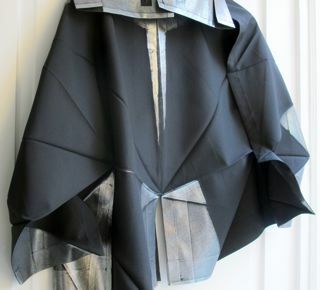 It’s hard to believe that it is only plastic and it’s amazing how a flat folded square can become a stunningly sculpted skirt or top. I’d wear it anytime. The work is aerily and beautifully displayed. We strolled around, visiting Fartygsmagasinet, Happy Stockholm and Ljunggrens papper. 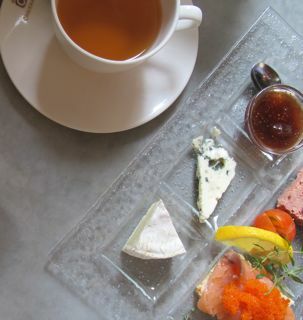 We had afternoon tea at Chaikana, beautifully situated tea house just by the German church. A lovely, if a little pricey, way to take tea! Further away for me, the exhibition The Future of Fashion is Now is on at Museum Boijmans Van Beuningen in Rotterdam. I’d love to visit that. 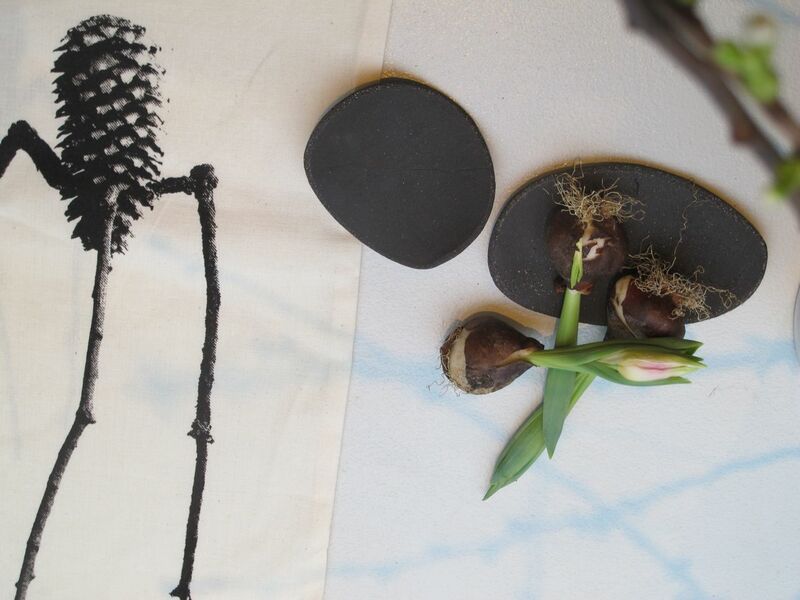 Cherrie branches in the window and tulip buds resting on an oval-shaped stoneware dish that I’ve started making and fallen in love with! And in the same window the wonderful scented candles from KOBO, each and every one smells fantastic. 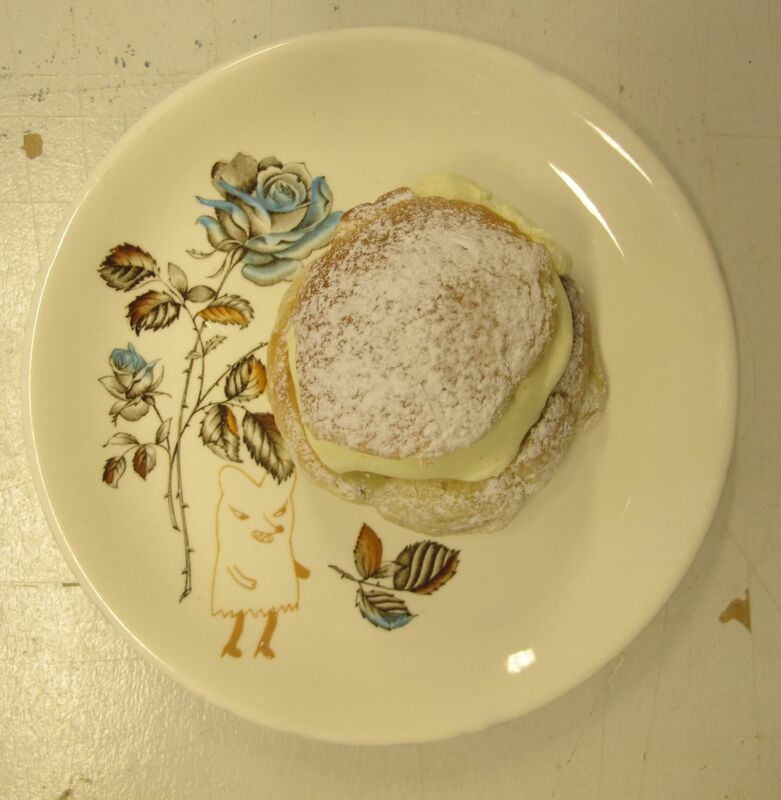 And yesterday we had semla! I thought I’d have to que up outside the bakery like everyone else (it was the day for semla), but found two delicious looking (and – as it turned out – tasting) semlor at Lima deli on Åsögatan. PS The sale continues for another two days in the webshop! 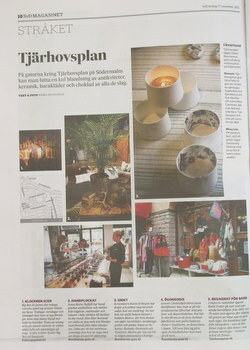 manos was featured in SvD on Saturday, in a really nice little article about the neighbourhood around Tjärhovsplan. 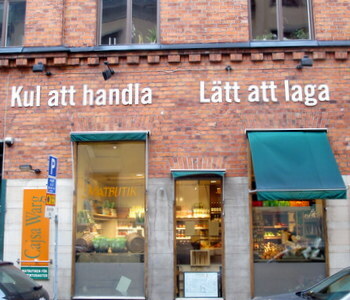 I love local and there is a lot of good local at Södermalm. 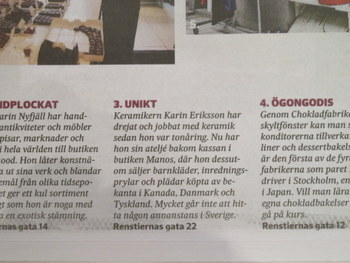 Other neighbours mentioned in the article was Chokladfabriken, In the Mood, Big Ben and Butik Under. I could add lots of other places but for now I’ll mention my closest food shop, Cajsa Warg – great local produce and a wonderful atmpsphere and surrounding to shop in. 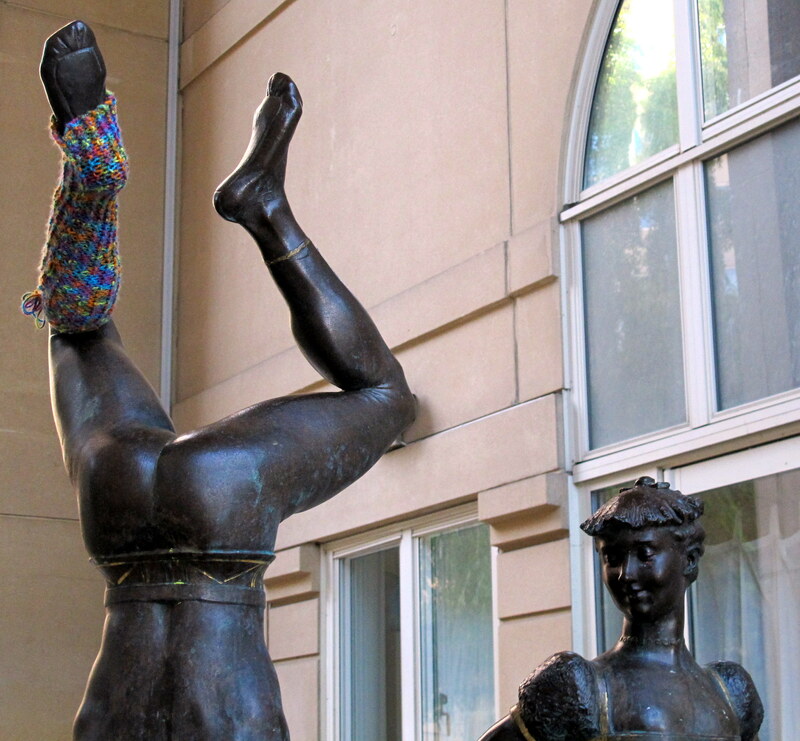 Leonard and I pass this statue on our way to kindergarten and someone was kind enough to dress it up in leg warmers. It’s getting chilly now and the time of leg warmers and gloves is here. The other day I picked up candles that I’ve ordered from Stockholms Ljusstöperi, which is just a few blocks from manos. 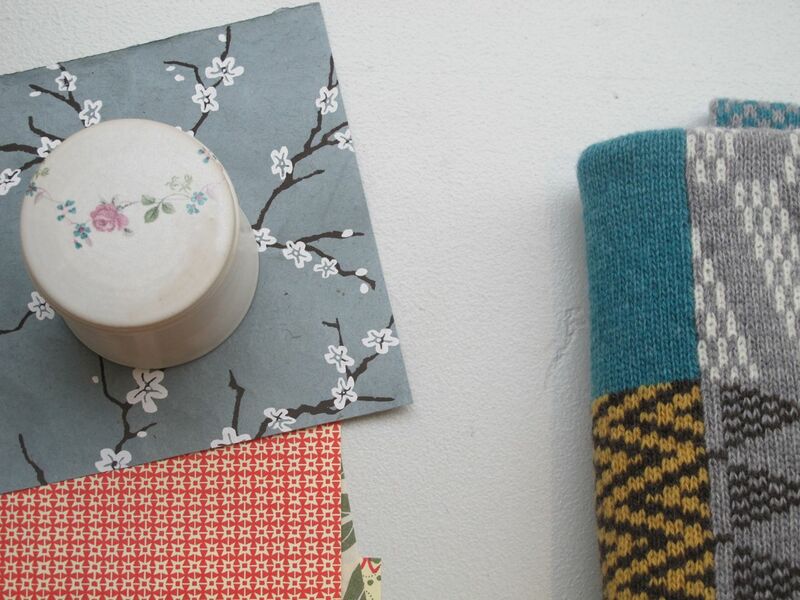 I love having locally produced things to sell in the shop! Stockholms Ljusstöperi is a wonderful candle maker “factory” and café in one. 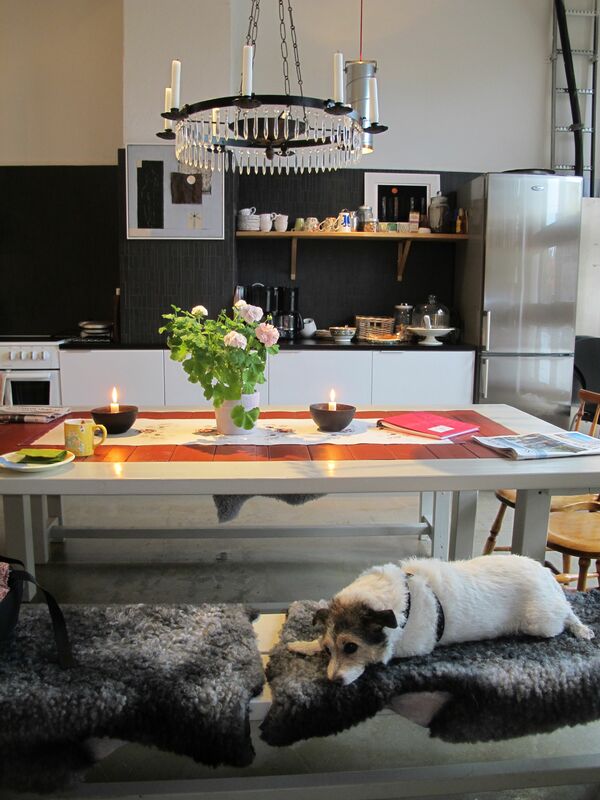 The candles are hand made by Mimmi and her assistant. 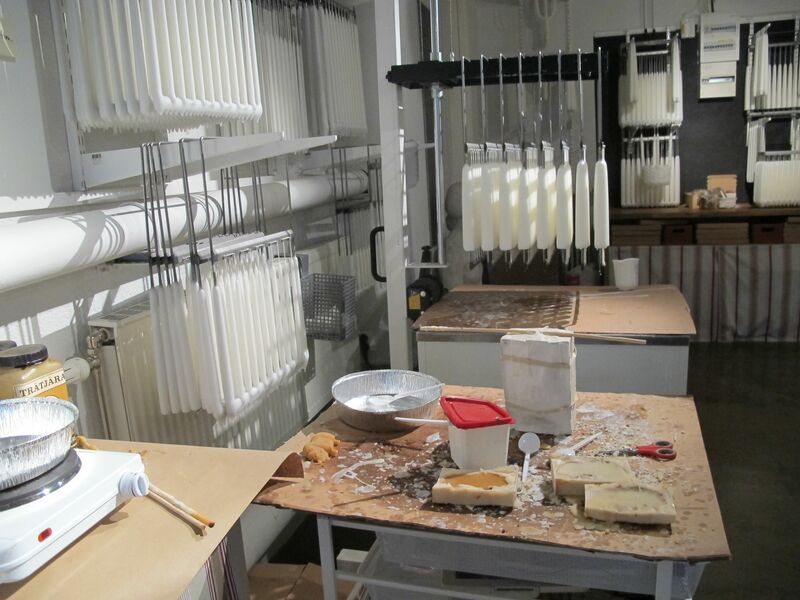 I now have their candles in the shop – 23, 30 or 40 cm long. 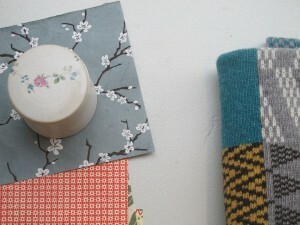 Lisa Vilhelmson came by with a re-fill of her beautiful towel collection. She helped out with the June window display that can be admired here and here. Lunch was dumplings from Beijing8 that just opened around the corner. What a treat! 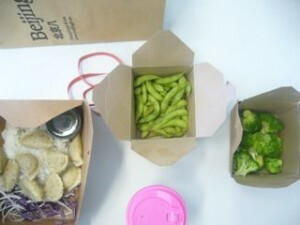 It was delivered beautifully and tasted fantastic – now I know what dumplings should taste like. Don’t miss this place if you’re in Stockholm! The other evening I treated my ever supportive man and parents and my lovely helper Karin to Christmas dinner at Aarts restaurant on Åsögatan. It was a wonderful treat to sit down in their beautiful environment and be served an exquisite four course meal of carefully chosen and cooked delicacies. Just enough food to make us happy and content. The next day, since I didn’t have any left over food from the evening before, I went in to Starre & Co, the newly opened fish shop on Borgmästargatan and bought myself a lovely haddock gratin. Lastly, this year I’ve had the fluffiest and most delicious tasting Lussekatter (saffron buns) from Saltå Kvarn at the corner of Renstiernas gata and Åsögatan. These are just a few jewels from manos’ neighbourhood, I’m sure I’ll be back with more soon! You are currently browsing the archives for the manos neighbourhood category.